The V60 series has been discontinued. Please contact our Flow Engineering department for a viable replacement. 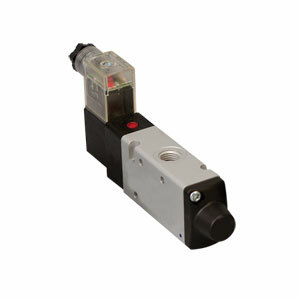 V60 Series pneumatic in-line directional control valves are available for 2-way, 3-way or 4-way operation. These pneumatic valves can be operated by air pilot or solenoid pilot with low power consumption 24VDC solenoids. These direction control valves can be surface mounted or din rail mounted with the optional din rail mounting kit. The V60 Series directional control valves have high flow rates and are available in multiple port sizes. These valves can be used as individual pneumatic valves or can easily be assembled in a 3 valve manifold with one or multiple manifold bases to create a stacking valve bank. All directional control valves in stock have manual overrides, 24VDC solenoids and cable grip connectors with indicator lights, other options can be requested. The V60 Series directional control valves are spooled valves designed to operate linear motion control components and require air filtration of 50 microns or better. 4-way, 2-position directional control valves are the most common valve used to operate a pneumatic double acting cilinder. For best control of pneumatic components, flow control valves (regulating out) should be installed to regulate the speed of the device. Response Time Range: Solenoid 23-56 ms, spring return 26-56 ms.
3/2 valve is also known as a 2-Way valve (drawing 1), with 3 air ports and on-off output air. Port #1 is the supply air, port #2 is the control output air and port #3 is the exhaust air. 2 x 3/2 valve (drawing 2) is two independent 2-Way valves that share the same valve body. These valves can be manifold mounted with 2 or 3 valves per manifold. Port #1 is a shared supply air, port #2 & 4 are for the control output air and port #3 & 5 are for the exhaust air. 5/2 valve (drawing 3) is also known as a 4-Way valve with 5 air ports and 2 output air ports. This valve is typically used to extend and retract a cylinder. These valves can be manifold mounted with 2 or 3 valves per manifold. Port #1 is the supply air, port #2 & 4 are for the control output air and port #3 & 5 are for the exhaust air. Air pressure regulator and filter 1/4"
Air pressure regulator and filter 3/8"
참고: * Valves require a regulated and filtered air supply to operate properly. Valve manifolds can be stacked to create larger valve banks.